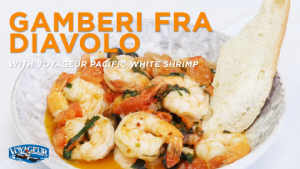 Gamberi Fra Diavolo | Recipes | Oceanfood Sales Ltd.
To make a delicious Gamberi Fra Diavolo, heat 3 tablespoons of olive oil in a large skillet on medium heat. Sweat the onion, add garlic, shrimp, olives, capers and sauté on high heat until shrimp are lightly cooked and garlic is roasted. Deglaze pan with white wine, add tomatoes, crushed red pepper flakes, basil, simmer until wine has reduced. Serve on a torn baguette, in a large pasta bowl. Do you have a question, comment, or concern? Please take a moment and fill out our contact form below or give us a call. © 2019 Oceanfood Sales Ltd.